All over the world, the month of February usually ushers in the spirit of love and great moments, but too many people often forget or overlook the ones who matter most. This was not the case with the Adetulas, who have taken time to pay more attention to what is most important this season of love. Some have come to the realization that not every finger is equal in life, because of limitation in education, poor family background, one disability or the other and some other social factors. To this few has been given the gift of understanding, compassion and most especially, the ability to show love to another despite all odds. Perhaps not too many people care about the suffering of others; but to claim not to know, is to see this suffering as normal and something that cannot be helped, when it is not so in actual fact, if only we care enough to be moved to get up and do something about it. The FLA kids will always remember the 10th of February, 2013, fondly, as it was the day when Mr and Mrs Adetula fulfilled their promise and opened their arms to them, showing the greatest love of all. Eng. Ola Adetula arrived at the Home of Fair Life Africa Foundation, in Lekki, Lagos, around 2pm on Sunday, to pick six of the best behaved boys. I accompanied them as a chaperon to visit the Adetulas’ residence in Ajah, Lagos and spend the day with them. As the car moved through Lekki/Epe express road, Eng. Adetula pointed out interesting sights like big companies to the boys, explaining what they do, who owns them and how they grew from nothing to becoming successful big names in the society. He showed the boys modern market structures and estates, encouraging them to work hard now that they are young, so as not to suffer or beg in old age. The boys arrived at the Adetulas’ beautiful home around 3pm, and as they were stepping in, Mrs Bisoye Adetula welcomed them with a heart melting smile the boys had seen several times before, when the family visited the FLA Home with gifts. 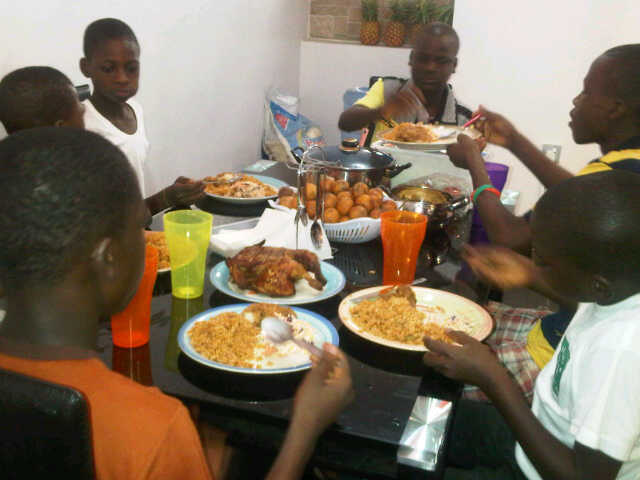 Some moments later, she directed the boys to the dining area of the house to be served lunch. 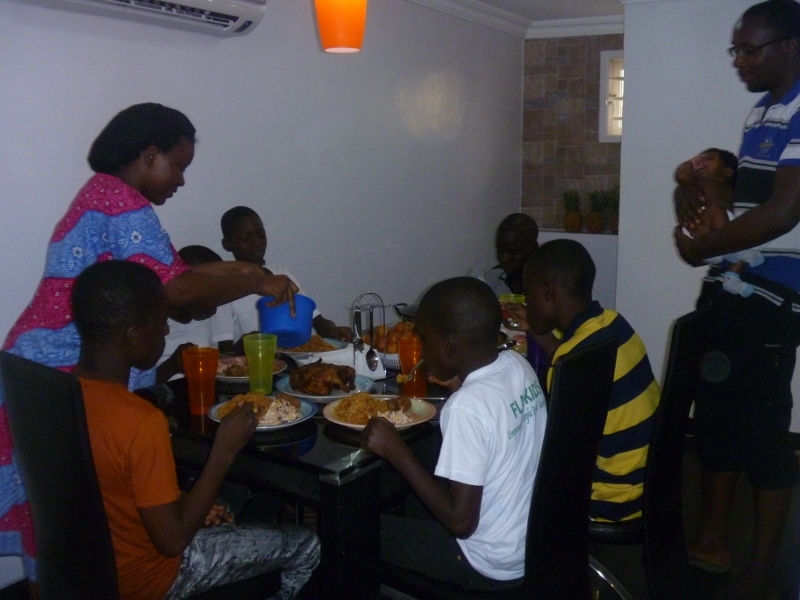 Mark, one of the boys who had easily taken on the position of a leader on this fun journey served the jollof rice, and chicken with salad and milk shake prepared by Mrs Adetula. There was also plenty of chilled fruit juice by the side. After this delicious meal,Mark, cheerfully cleared the dining table, cleaned and did the dishes without being told. Eng. Adetula, being so pleased with this action, gave him an original Fossil wrist watch that made everyone gasp when they saw it! After this delicious meal, the boys and the Adetula family sat in the living room to enjoy an animated cartoon called Shrek in 3D. Unfortunately, the 3D glasses’ batteries were down, but they still had so much fun watching the movie, and other shows with lots of cherries (furit) to nibble on in the process. As the boys watched the Nigeria-Burkina Faso match, which was on that evening, they were all served iced cream by Simon, the youngest of the FLA Kids, who just kept smiling throughout the day because of how freely the Adetulas allowed them move around in their home and their kitchen. For dinner, Mrs Adetula prepared spaghetti and a whole roasted chicken, done exactly like the thanks giving turkey for the boys. At this point, all the boys looked like they had footballs hidden under their T-shirts. Sunday Mba shot the golden goal, and everyone shouted with joy! The atmosphere was electric, as the spirit of acceptance, joy and warmth radiated in the home at that moment. When Nigeria finally won the game, the boys kept jumping and pointing at Joseph Yobo, a friend of the Home, who had visited them during the Christmas celebration, with pride. When the time came to leave, the boys did not want to leave the Adetulas; they all wanted to stay longer, because of the love and acceptance the Adetula family showed to the souls needing hope and guidance on their journey to find peace and a place they really fit in. But it will always be an experience they will carry and cherish, an experience no one can ever take away from them as they move on in life.